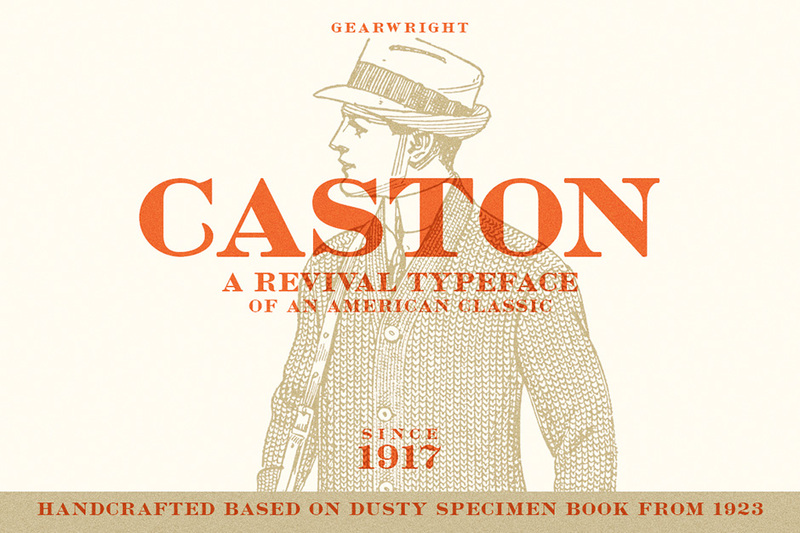 Caston is a revival typeface based on Morris Fuller Benton’s modified litho – initially designed and issued by Inland Type Foundry back in 1907, later modified and issued by American Type Founders in 1917 after the merge. Not only is the typeface now in the hands of public domain due to the defunct ATF a decade ago & it lacking any active descendants – no known digital font was found on the web, until now. In short: Caston is a versatile vintage typeface that expresses craftmanship & authenticity. And that’s how I was drawn to it in the first place. Take Caston for a ride, you’ll be pleased with its simplicity. You’ll also find a pack of 5 vintage illustrations (all illustrations used in previews) in .AI vector & high resolution .PNG. I packed them in as bonus to the font. These illustrations were scanned and optimized from my personal collection of vintage catalogs back in the early 1910’s. File size is approx 9.3MB (9.9MB unzipped), offered as a single download. Thanks for your comment, Michael 🙂 We hope you enjoy working with your new font! Very nice, very usable. Thanks. Thanks for your feedback! It’s so great to hear you are liking this font and it will make a useful addition to your creative toolkit 🙂 We hope you enjoy working with it! i can not see where i can download this nice font??? Thank you so much for picking up this freebie! We hope you enjoy working with it 🙂 In order to download this, you will need to be logged on to your account page at http://www.designcuts.com/login. Once you are logged in, you should see the the name of your bundle and the link to ‘View Files’. If you click on this you should be taken to the page that will allow you to download your new font! Thank you so much for this wonderful font! Thank you so much for your comment! You are very welcome 🙂 We hope you love working with your new freebie! LOVE! Gorgeous and classical! Thank you so much for the font and the swoonworthy vintage images… they’re lovely, and the clean book style is a welcome change to my stash after the recent ‘swashy script’ craze. A fantastic and very useful font! Thank you! Thank you so much for your kind words! It’s fantastic to hear that this font will make a really useful addition to your creative toolkit 🙂 We hope you love working with it! Great font. Thanks so much for this week’s freebie! Wish there was variation in weight, but oooo… vintage illustrations! Fun! Thank you. Thanks for your comment! We’re really sorry there are no additional weights with this one but we’re pleased you’re loving the vintage illustrations 🙂 We hope you enjoy working with it! Thank you so much for your awesome comment 🙂 It’s so great that this font gets full marks in your book! We hope you enjoy working with it. Thank you so much, Pedro! 🙂 We hope you enjoy your new freebie! It’s a fine font… It’s free… and it’s Friday. Don’t let it bring you down. Thank you very much DC. I hope this helps, Waldemar, and my apologies again for any inconvenience caused. Please don’t hesitate to contact me should you have any other questions. I’m here to help!